Houston made an abrupt transition from “winter” to “spring” in the middle of February, and the second half of the month was abnormally warm. 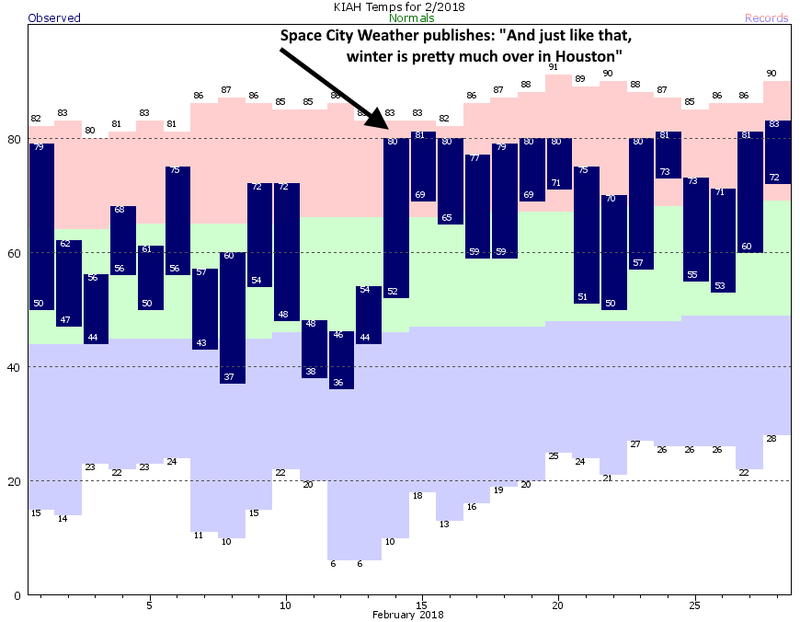 (Note: On the morning of Feb. 15, we published a blog entry titled, “And just like that, winter is pretty much over in Houston.” Just sayin’). Overall, the month of February ended up being 6 degrees (in Houston) to 8 degrees (Galveston) above normal. As we get deeper into the spring, we’re going to see fewer cold nights. This week a strong front will push overnight low temperatures back into the 40s for the first time since Feb. 13. If you like the colder weather, enjoy this, because we may only get one or two fronts this strong for the rest of the spring season—before we get into summer proper. The radar is quiet across the Houston area this morning, but that will certainly change later today. We will see a mostly cloudy conditions this morning, with warm, muggy temperatures rising into the low 80s. Rain chances will increase this afternoon, and probably peak around the evening rush hour as a cold front approaches, and moves through the Houston region. Most of the area will probably see 0.5 to 1.0 inch of rain, with higher isolated totals, and we definitely could see some heavy showers and some scattered thunderstorms. The further north, the greater the potential for severe weather. The front should push into the Gulf of Mexico before midnight, with most of Houston cooling down nicely into the 50s. We’ll see sunny, dry weather in the wake of this front, which should lead to a mid-week spell of some very fine weather. I’m expecting high temperatures in the 60s to low 70s, with cold nights. How cold it gets will depend upon the extent to which overnight clouds develop. Some inland areas on Wednesday and Thursday night could reach the upper 30s—places like Huntsville. Most of the city will stay in the 40s, with the coast staying in the 50s. Moisture levels begin to rise again on Friday, and we should see the return of some clouds, and scattered showers on Friday night and Saturday morning. But for the most part, at this point, the weekend looks fine. Sunday, especially, should be a pretty sunny, dry day. Fingers crossed! Does all this weather now (i.e. warmer than normal temps) have any impact on what the hurricane season will look like? Probably not. Our weather in February or March rarely has much connection to summer-time conditions in the Gulf of Mexico. However, after the cold winter it is worth noting that sea surface temperatures in the Gulf have already climbed back to above-normal levels. Why would that be ? Do we have currents pushing warmer water into the GoM, or is it just soaking up the higher ambient temperatures? OK, so how good are you guys at forecasting stocks? If one tracks the wild swings we’ve had in stock markets since late Jan, they’re very similar to the wild swings between 25 and 80 F during the day time. Which you guys ably forecasted. So, you can’t be any worse than the “talking heads” on the TV business channels! Is there any way to see past weather radar? 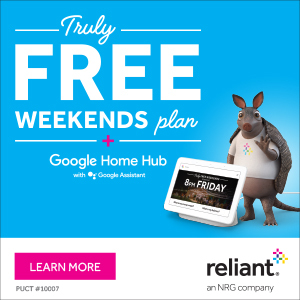 Specifically a 24 hour loop of 1-6-17 of matagorda bay?